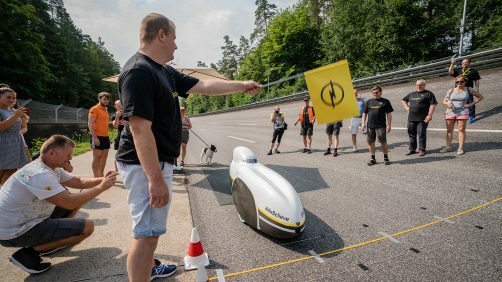 A race against the clock: Nicola ‘Nici’ Walde made an attempt to break the world record at the Opel Test Center in Rodgau-Dudenhofen from 28 to 29 July. 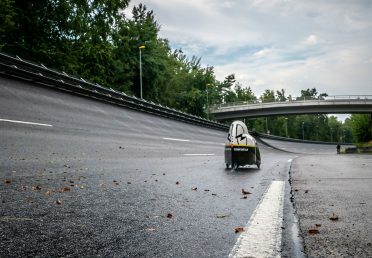 Nici Walde wants to break the 24-hour world record in a velomobile at the Opel Test Center in Rodgau-Dudenhofen, Germany. To do so, the 44-year old has to cover at least 1,012 kilometers in her aerodynamic recumbent. It’s 10:28 a.m. on a Saturday at the Opel Test Center track in Rodgau-Dudenhofen. Nici Walde rolls to the start line in her aerodynamic recumbent. 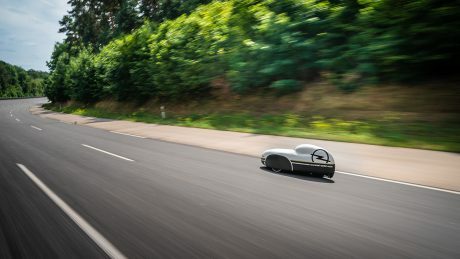 This three-wheel racer – fully decked out, and called a velomobile in technical jargon – has been equipped to defy the trials and tribulations it will face over the next 24 hours. This athlete has set her sights on beating the world record, and will have to put herself through the mill – both physically and psychologically – to do so. To be more precise, the 44-year old sought to beat two world records last weekend: the 24-hour world record for women (1,012 kilometers) and the world record for men (1,219 kilometers). “We are doing our best to support this ambitious, outstanding athlete in realizing her dream. 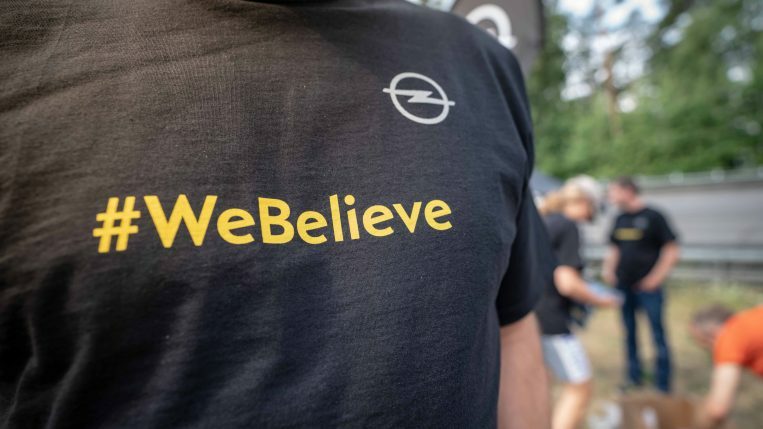 We are cheering Nici on with the slogan #WeBelieve, because we truly believe that she’ll knock it out of the park,” says Johan Willems, Vice President Communications Opel Group. But why would someone choose to push their body to its limit over 24 hours like this? How has this exceptional athlete prepared for the race? And what could stand in her way? We interviewed this super fit professional musician 24 hours before her race, and checked in with her again later on. Live wire: Walde and her custom-made velomobile, a three-wheel 14 kilogram recumbent. And we’re off! 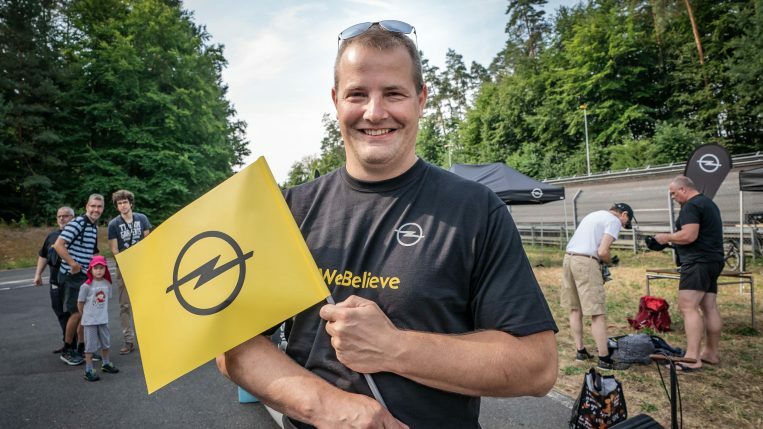 André Lange, the most successful bobsledder at the Winter Olympics, brandishes the Opel flag and gives the starting signal. I had always dreamed of setting a record in a niche sport as a newcomer. I’ve had the world record at the back of my mind for years. I once managed to cover at least 1,100 kilometers, but my performance back then wasn’t assessed officially. In general, I think it’s amazing to be able to achieve something special like this. And thankfully, I have a body that can perform. I regularly participate in bike racing competitions, and love it when sport really challenges your body. It will be the most important day of my life, but I’m in top form! Of course, this is an extreme situation that you can’t really train for as such. Generally speaking, you shouldn’t push yourself to the limit too often. The secret is to know your own capabilities, be flexible, and as strange as it may sound, don’t listen to what your mind is saying, but take heed of what your body is telling you instead. It will tell me at some point that I’m tired and need to sleep. It is exactly this feeling that I’ll have to overcome. My psychological state will also play a huge role. 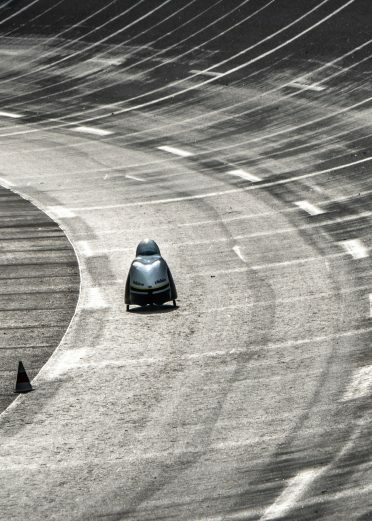 The 44-year old athlete circles the 4.8 kilometer high-speed track lap by lap. 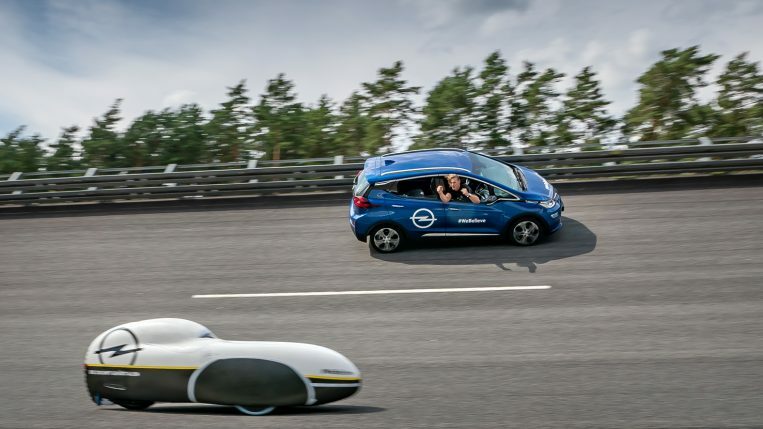 Cheering from the sidelines: The rower Karl Schulze also supports Walde during her race – in the photo above, he waits in an Opel Ampera-e, which is also a service vehicle for the race. The velomobile weighs about 15 kilograms. It’s about 60 with me in it. Then I’ll have to get it moving and bring it up to speed. That’s why I want to try and avoid stopping. I have supplies onboard, in a kind of second built-in floor. I’ve got water, multivitamin juice, energy bars, potato salad, corn and tuna salad, and a few bread rolls with Nutella. Plus a few diapers, just in case. The body is made from carbon and nylon. That’s why it doesn’t splinter if you have an accident. It’s sturdy, yet flexible. There’s actually a recumbent underneath, with two wheels on the front and one on the back. There are six gears, and I can steer with a metal bar, just like on a plane. That may sound complicated, but you get used to it pretty quickly. It’s actually very comfortable, because I can lean my head back and don’t have to sit upright for 24 hours. Daniel Fenn posted an entry with the title ‘Wanted: Woman for 24 hours’ in a velomobile forum, as he was looking for a woman to break the 24-hour world record. Someone pointed me in the direction of the post – with the caveat that Fenn was meant to be a real wild card. We got on well from the very beginning, and since that very first day we’ve been partners, both out on the track and in private. People on the scene have even started calling us the ‘dream team.’ A week after I got the velomobile from him, I broke the world record for 12 hours. That was back in 2015. Conversion measures: Daniel Fenn seals the velomobile hood with a Bunsen burner, as the old strips of tape are no longer fit for purpose. 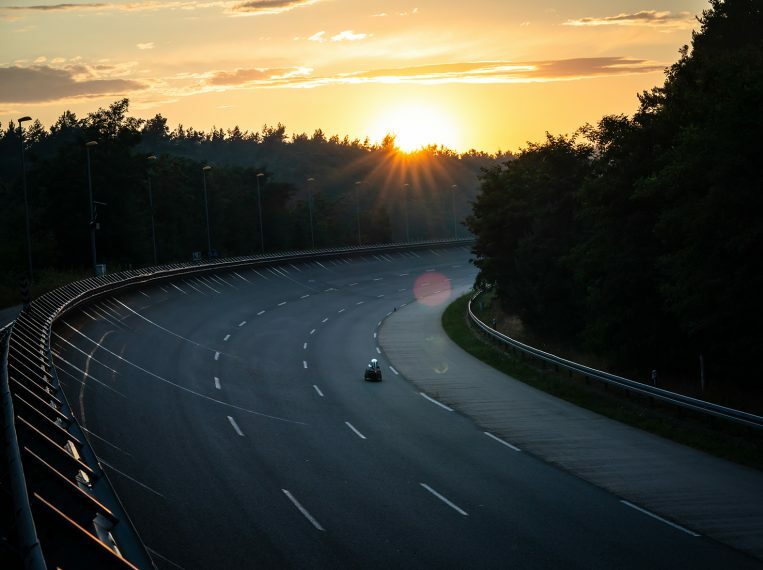 The track at the Opel Test Center offers the ideal conditions for the world record attempt, and Opel have given me a once-in-a-lifetime opportunity by supporting me. The weather and material are the only variables. The heat won’t be the problem – quite the opposite, because higher temperatures mean there’s less friction on the tires. The temperatures won’t be my biggest issue. Because I’m only 1.50 meters tall, I’ve a relatively small body surface to cool down. I’ll be in trouble if it rains, or if I get more than one flat tire..
Tough conditions: The track is still wet after the rain, and partially covered in foliage. Good morning: The sun brings the Opel Test Center back to life after a chilly night. Walde has been on the road for over 19 hours at this stage. Then, the athlete wasn’t able to make progress as she had hoped: “The track was still wet and it got relatively cold, which is why I couldn’t kick into gear properly.” After an excellent start, the men’s record of 1,219 kilometers faded into the distance, but the women’s remained within reach. However, her average speed sank to about five kilometers per hour on the wet track. Pine needles on the track gathered in the wheel housings, making another stop necessary. Refueling: Walde gets a snack every time she makes a pitstop. 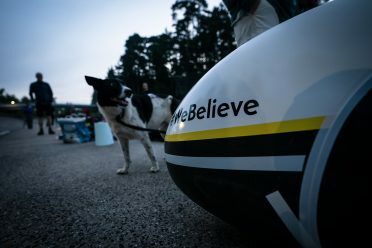 Even our four-legged friends are cheering Nici on at the Opel Test Center – while her velomobile flaunts the #WeBelieve hashtag in the foreground. 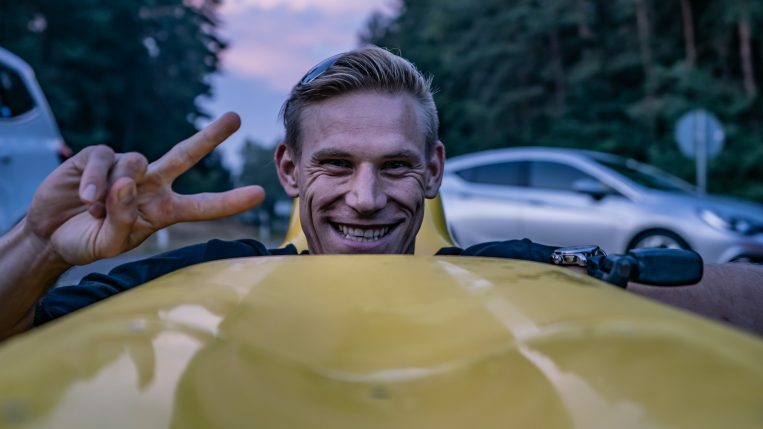 The world record: Walde crosses the finish line after 24 hours and 1,088 kilometers. 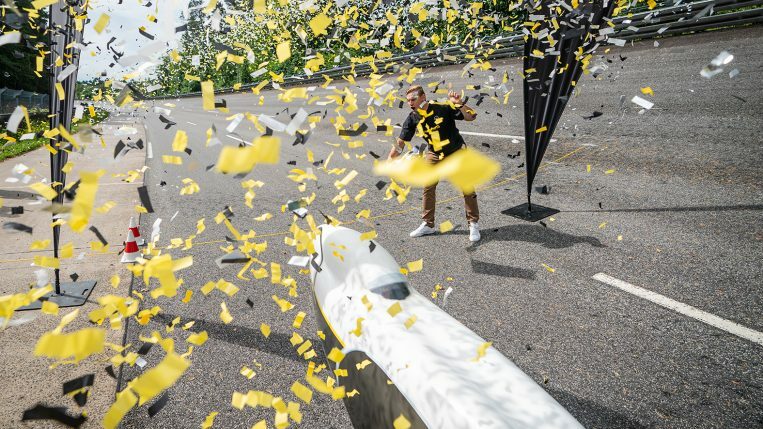 In cold print: Johan Willems, Vice President Communications Opel Group, hands over the certificate that verifies Walde has broken a new world record. A world record smashed after 227 lap! And how does she wind down after an intense day like this? Walde replies: “We drove to a forest in the Opel Vivaro after I had showered. We folded down the back seat and I slept for almost ten hours in peace and quiet.” In the meantime, she’s gotten over her virus and has had time to recover psychologically. “I’ll just have sore muscles.” She’ll also have the women’s HPV world record, though. No other woman has ever covered a greater distance powered solely by her own physical strength within a timeframe of 24 hours.